Extract single pages or a group of pages from a pdf file. 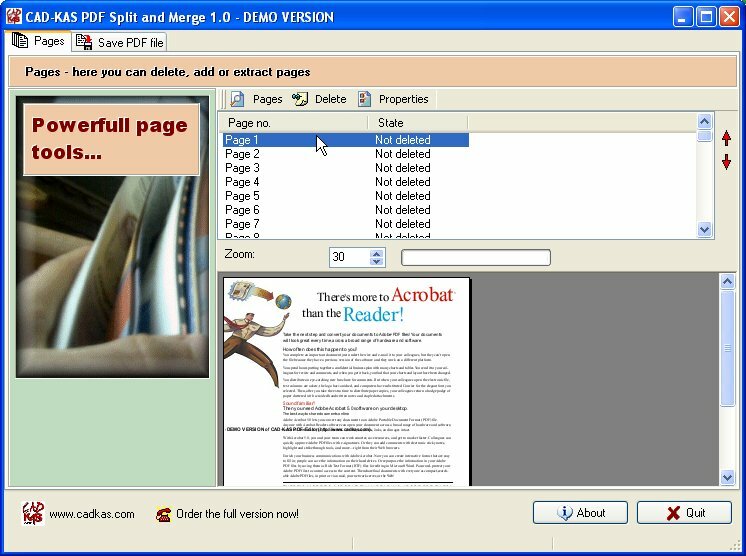 It is also possible to save every page inside a separate pdf file or to combine multiple pdf files into one big pdf file. You can change the order of the pages as you like. It is no problem to move the 3. page of the second pdf file between the first and second page of the first pdf file. You can also remove existing pages with one click. You are able to edit the meta information like author, title, copyright etc. too or to encrypt the pdf file and activate or deactivate limitations for printing or copying etc. If you only need to combine pdf files you can also use PDFs 2 One.